Fig. 1. Isabelle Pinson, The Fly Catcher, 1808 (without frame). Oil on canvas, 15.25 x 11.875 in. Snite Museum of Art, University of Notre Dame, Bequest of Edith and Dr. Paul J. Vignos Jr. ‘41, 2011.024.001. Photo: Snite Museum of Art. Isabelle Pinson’s Fly Catcher (L’attrapeur des mouches) seems at first glance a charming genre scene of a child at play (Fig. 1), a safe, inconsequential picture of innocence, and thus a suitable subject for a female artist to paint in 1808. But there is more than meets the eye: the painting gives rise to many queries. In the second half of 2012, around 150 people responded when the Snite Museum invited visitors to use post-it notes to answer the question “What more do you want to know about this painting?” The action of trying to catch a fly in one cupped hand is an unusual subject, and here I situate it primarily in the context of pictorial theory. Not much is known about Isabelle Pinson (1769-1855). There is no entry on her in the Grove Dictionary of Art; Benezit provides merely four lines and a reference to a portrait which is not by her. No monograph or catalogue raisonné exists, and only four paintings are listed in the online catalogue of works in French public collections (all portraits, only one of which is by her). The daughter of a footman and a maid, she was educated under the aegis of their employers, especially the sister of the aristocratic scholar and prolific encyclopedist Louis de Jaucourt. In July 1792, Isabelle married André Pierre Pinson (1746-1828), senior surgeon and maker of anatomical models in wax, whom she probably met through Jaucourt’s interest in anatomy. One of the signatories on the marriage contract was the renowned sculptor Jean-Antoine Houdon, who had produced busts for the Jaucourts. Isabelle thus moved in elite artistic circles, also receiving some training from the important academicians François-André Vincent and Jean-Baptiste Regnault. Raised in a relatively learned household, and well-connected with fellow artists, it is highly likely that she was familiar with historical anecdotes and standard artistic theory. Her artistic career indicates that the seeming observation of everyday life in the Fly Catcher could be subtly informed by intellectual aspirations, suggesting that Pinson strove at times to push beyond what were the limits then assigned to her gender. She began to exhibit at the Salon in 1796 and continued to do so intermittently until 1812, showing a total of 16 works. The Snite painting was hung at the Salon in 1808, but she tried a variety of genres, working in portraiture and genre scenes, once showing a still-life of flowers (1801), and in her final year exhibiting a history painting of Philemon and Baucis metamorphosed into intertwining trees as a reward for their generous hospitality and reciprocal love. That ambitious choice allowed her to blend mythology, romance, allegory and landscape. However, it was her first and last attempt at history painting and she never showed at the Salon again. Other seemingly straightforward subjects may also have contained undercurrents, such as her Young Greek Woman Spinning of 1801. The specification of nationality might simply indicate a genre scene tinged with the study of distinctive clothing, but it could also have been a neoclassical reference to Arachne, the skilled and hubristic artisan of mythology, on her own before the contest with Athena. Pinson’s works certainly treated the circumstances of her craft, in A Young Person in the Atelier Looking at a Portfolio (1800), A Woman at Her Easel with a Young Girl Near Her (1804), and A Young Girl Drawing (1806), all of which combine genre with a reflection on circumstances of art-making, probably conveying the mood of contemplation of work in progress. In fact, the 1804 painting is surely the Self-Portrait at an Easel and With a Young Girl that was on the art market in 2003, in which the girl holds the artist’s arm while looking at the canvas, whereas the painter (mother?) looks out at the viewer, that is, at a mirror. The same theme of visual inspection must have featured in Young Woman Before a Mirror (1806) and A Mother Placing on her Daughter’s Head her First Hat (1808), probably in a setting with a mirror. Fig. 2. Jacques Gondoin, Description des Écoles de Chirurgie (Paris: Cellot et Jombert, 1780), Pl. VIII. Photo: Wikimedia Commons. Shown at the Salon of 1808, Pinson’s Fly Catcher depicts someone’s son (the artist’s?) at a liminal moment, when he looks up from his books and recorder onto a world of monumental public architecture and a sky signaling endless opportunities. The Neoclassical building with its Ionic colonnade is the École de Chirurgie (Fig. 2)—on Rue de l’École de Medecine in Paris’s 6th arrondissement—designed by Jacques Gondoin and completed in 1774. We see the left half of the facade and some of the reliefs situated at the main entrance, a view that was probably possible from either the address the artist gave in the Salon’s livret that year, “rue de l’Observance, n. 3” (now Rue Antoine Dubois, at or near the corner on the side of the street closest to the École), or from neighbors at number one. Pinson’s husband was a highly placed military surgeon, and she produced several portraits of medical celebrities. She thus situates the scene in a familiar and professional context, one that refers to both her husband’s occupation and her own milieu. Fig. 3. Detail of Fig. 1. The boy is not simply playing. In the immediate moment, he concentrates on catching the large fly on the windowpane, having already captured another specimen and placed it in the downturned glass resting on the ledge below (Fig. 3). A fledging man of action, he asserts his dominion over nature, develops his scientific curiosity, and anticipates his professional future—notably in contrast to the other painting Pinson showed at the Salon that year, A Mother Placing on her Daughter’s Head her First Hat (1808), which conveys the message that girls, unlike boys, should care about little more than their appearance. However, the woman who painted these canvases was very much engaged in the world, a keen observer drawing out cultural and emotional implications from what initially might seem like views of incidental existence, perhaps based on her own family. She turned that quotidian material into a series of self-assured statements about some of the fundamentals of art making. 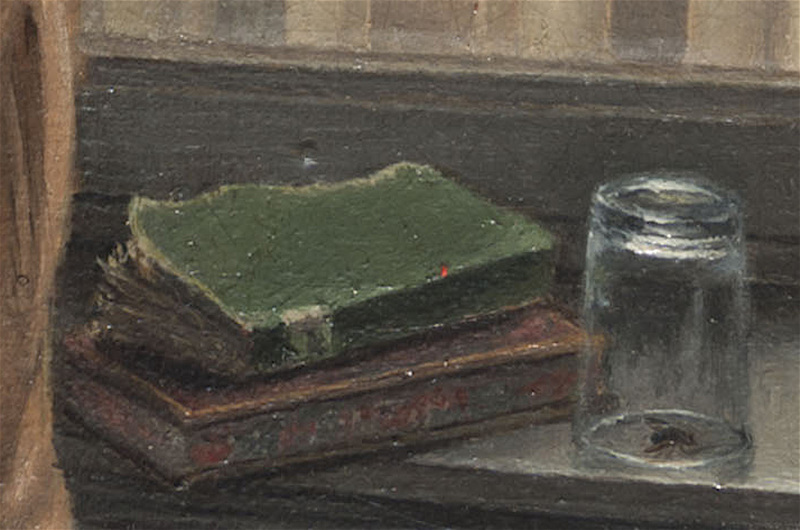 The detail of the drinking glass in the Fly Catcher, for instance, adeptly handles the challenges of perspective, the difficulty of rendering on a flat surface a round object that stands on a receding ledge, and the problem of convincingly depicting transparent, shimmering material. Even more transparent is the window, cleverly painted at its lower edge as though smudged with grime and otherwise suggested by the grid of its frame and lock rather than by any flaws or reflections in its glass. Running parallel to the picture frame along the right edge, the window’s frame brings to mind the renowned Albertian precept that a painting is framed like a window. Yet at the top and right-hand edges, the window extends beyond the picture frame, blurring the barrier between representation and reality. However, the view through the window is not the chief subject of the canvas, which insists instead that a domestic interior is a valid space and subject for art. Or, rather, it is the interplay between internal and external space, between flat surface and illusionistic depth, which is presented as the fundamental subject of figurative art. Whereas the window and its ledge are constructed at a slight diagonal to the picture plane, the dark green curtain—pulled aside as though to reveal the painting—appears to be parallel to the surface of the canvas. Its tassel illusionistically seems to dangle in the viewer’s space, accentuating the pleasurable liminality of artifice. The other key and more evident element in the painting is the fly. The insect forces the eye to move between distant sky, imagined window, and the planar surface of the picture. Indeed, one might even check to see whether the window is open or closed, the fly on the inside or the outside, before settling into the illusion that the boy’s hand and the fly might soon make contact. His concentrated gaze and intense focus, seeming to draw in a breath, impel viewers to follow suit. He leans forward, the flap of his bright red jacket moving with him, and the diagonal of his body intersects with the reverse diagonal of the window, setting up a subliminal instability that adds to the sense of tense anticipation. 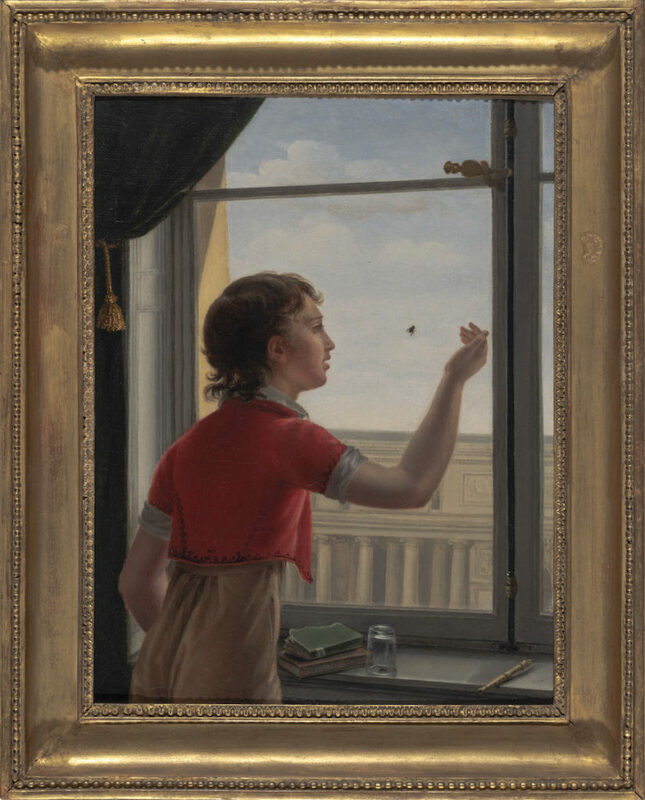 Whether or not the insect will be caught this time, it is trapped by the gaze of the boy and of the viewer, carefully placed in the compositional pincer between eye and hand. Picturing the necessary conjunction of mental agility and manual dexterity that is central to the making of art, let alone the catching of a quick, erratic fly, the painting has already ensnared the creature in all its detail. The ultimate “fly catcher” is the artist herself. The label written in response to the Snite’s “Post-It Project” of 2012 ends on the creature: “Flies sometimes figure in French fables and allude to something sinister or bloodthirsty. The scene may be interpreted as an allegory of the loss of innocence or the corruption of youth.” Indeed, extensive literature on the iconography of the fly relates it to Beelzebub (Lord of the Flies), evil, sin and death, whether it crawls over skulls and decaying fruit or is contrasted with the salvific Christ. On the other hand, Pinson’s boy is trapping, confining and suffocating this insect rather than enabling its escape. If the painting works on a moralizing register at all, it seems to posit that corruption is far from complete, the boy still years from coming of age. The public world may be sinful, but it waits on the horizon, as it were, pending rather than present. Instead, many painted flies indicate skill, self-consciousness, and artistic wit, for they are central players in the tradition of trompe l’oeil. A few rare but famous tales about fellow artists fooled by illusionistic artistry joined various ancient stories about birds, bees, horses and so on being tricked. Pliny reported a contest between two renowned artists in which Zeuxis’s painting of grapes seemed so real that birds flocked to eat them, but that artist was trumped when he asked Parrhasius to remove a curtain that turned out to be deceptive painting. By the mid-fifteenth century, a similar tale circulated about Giotto, the late medieval painter who pioneered the Renaissance attention to naturalism. As an apprentice, Giotto supposedly painted a fly on the nose of a figure, which his master Cimabue repeatedly tried to brush away. Appearing in a secular scene, Pinson’s insects have little to do with the Lord of the Flies and much to do with the import of these anecdotes about illusion and trickery. During the Renaissance and after, the fly was “an emblem of artistic skill, of the artist’s ability to create illusions,” and “the trademark of artistic excellence,” often situated close to an artist’s signature. As a pictorial trick and evocative symbol, the fly appears in several French portraits of the eighteenth century, as well as in Pierrot Catching a Fly attributed to Philippe Mercier (c. 1740-1750). Pinson’s Fly Catcher refers to this tradition of virtuosity, deception and immediacy, absorbing it into a genre scene that also features the classic “window” central to figurative art. As with wasps and busy insects appearing in still-lifes, the fly in such works is not only a memento mori signifying decay and death. It also alludes to busy, ongoing activity, evoking buzzing sound and teeming motion in the midst of seeming stillness, and enhancing the affirmative sense of immediacy. Flies are themselves tricksters in that they unpredictably dart between stasis and motion, silence and hum, and just as it takes a quick hand to catch them it takes an alert, perceptive eye to see them, let alone capture all their fine details. If the fly’s lifespan is short, its pictorial representation is long. In the words of the well-known Hippocratic aphorism, ars longa, vita brevis. As Anna Eörsi has pointed out, there is much playfulness in the tradition of the pictorial fly, for it sets up a knowing wink with informed viewers, and among artists. Such trickery suits the boy’s diversion in Pinson’s painting, as well as the public presentation of her character. She smiles in two self-portraits she painted, rather than adopting the formal impassivity common in the genre, and appears similarly pleased in the miniature portrait of her holding a palette by Lié-Louis Périn-Salbreux. The Fly Catcher is filled with wit, that is, clever humor combined with keen, inventive intelligence. More or less excluded from history painting, considered the epitome of theoretical ventures, Pinson nonetheless found a subtle way to engage with the intellectual foundations of art. She refers to famous theoretical precepts and anecdotes, yet enfolds them in the semblance of genre in order to play on the notion that art presents an illusionistic window. She thereby merges the traditionally masculine world of history and theory with the conventionally feminine world of domesticity and materiality, forging an unusual, thoughtful hybrid. Calendar of Events. The Snite Museum of Art (September-December 2012), 34. Benezit, Dictionary of Artists (Paris: Gründ, 2006), vol. 11, 21. No life dates are given, and the portrait is said to be 1774. See Le portail Joconde, (accessed 7 September 2018). A search for her name yields three versions of the same portrait of Madame de Launay, signed “Pinson” and dated 1780, when Isabelle was eleven and did not yet have the surname Pinson, and a portrait of the physicist Pierre Noël Famin. Other works, such as the Family Group at the Bowes Museum signed “Pinson” and dated 1781 (B.M.942), and the Concert in a Park signed “Pinson” on a book’s label, are somewhat naïve with features such as disproportionately large heads. They must be by another artist because Isabelle (née Proteau) did not marry until 1792. The chief biographical studies are Georges Boulinier, “Une artiste à l’Ecole de Médecine de Paris: Isabelle Pinson (1769-1855),” Histoire des sciences médicales 31: 3-4 (October-December 1997), 351-357; and Boulinier, “Notes biographiques sur le peintre Isabelle Pinson (1769-1855),” Dix-Huitième Siècle 36 (2004), 249-254. Émile Bellier de la Chavignerie and Louis Auvray, Dictionnaire general des artistes de l’Ecole Française (Paris: Renouard, 1885), vol. 2, 281. A color reproduction is on the public site www.artnet.com and details are provided to subscribers. The canvas was bought in at the sale of Tableaux Anciens et du XIXe siècle, Christie’s, Paris, 26 June 2003, lot no. 84. The artist’s face accords with that of another self-portrait (for a detail, see Boulinier, “Une artiste,” fig. 3). It was sold at Christie’s, Paris, 4 July 2006. It is today the Université Paris 5 René Descartes. Gondoin envisaged an open space opposite the École, but apartments were presumably built in time for the Pinsons to move there in 1795 (for the date see Boulinier, “Une artiste,” 353). Jacques Gondoin, Description des Écoles de Chirurgie (Paris: Cellot et Jombert, 1780), Pl. VIII. As Pinson’s only two works exhibited in 1808, they were probably conceived of as a pair: Explication des ouvrages de peinture, sculpture, architecture et gravure des Artistes vivans (Paris: Dubray, 1808), 74. However, the inscription she devised for her tomb, while lavishly praising her husband, did not laud him as a father and made no mention of children (Boulinier, “Notes biographiques,” 254). Leon Battista Alberti, On Painting and On Sculpture, ed. and trans. Cecil Grayson (London: Phaidon, 1972), 54-55. Seen 23 August 2018. The Calendar of Events credits the label to curator Cheryl Snay. For example, Erwin Panofsky, Early Netherlandish Painting (New York: Icon, 1971), 488-489 n. 5; Harry Kühnel, “Die Fliege: Symbol des Teufels und der Sündhaftigkeit,” in Walter Tauber, ed., Aspekte der Germanistik: Festschrift für Hans-Friedrich Rosenfeld zum 90. Geburtstag, (Göppingen: Kümmerle, 1989), 285-305; Esperanza Estella Aragonés, “El vuelo de la mosca: Beelzebub en las artes,” Archivo español de arte 75: 300 (2002), 439-446. Ernst Kris and Otto Kurz, Legend, Myth, and Magic in the Image of the Artist (New Haven: Yale University Press, 1979), 61-66; André Chastel, Musca depicta (Milan: Franco Maria Ricci, 1984), 11-36; Anna Eörsi, “Puer, abige muscas! Remarks on Renaissance Flyology,” Acta Historiae Artium 42 (2001), 7-22. Pliny, Natural History, trans. H. Rackham (Cambridge, MA: Harvard University Press, 1952), pp. 308-11 (35.36.65). Norman Land “Giotto’s Fly, Cimabue’s Gesture, and a Madonna and Child by Carlo Crivelli,” Source: Notes in the History of Art 15 (Summer 1996), 11-15. Land, “Giotto’s Fly,” 14; Eörsi, “Puer, abige muscas!,” 8. André Chastel, “De la burla au lazzo della mosca,” in Scritti in onore di Giuliano Briganti (Milan: Longanesi, 1990), 235-240. 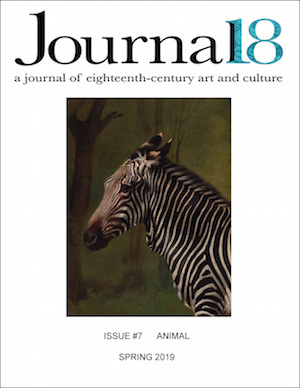 Cite this as: Patricia Simons, “Isabelle Pinson’s Fly Catcher (1808): Genre, Anecdote, and Pictorial Theory,” Journal18, Issue 7 Animals (Spring 2019), http://www.journal18.org/3532.